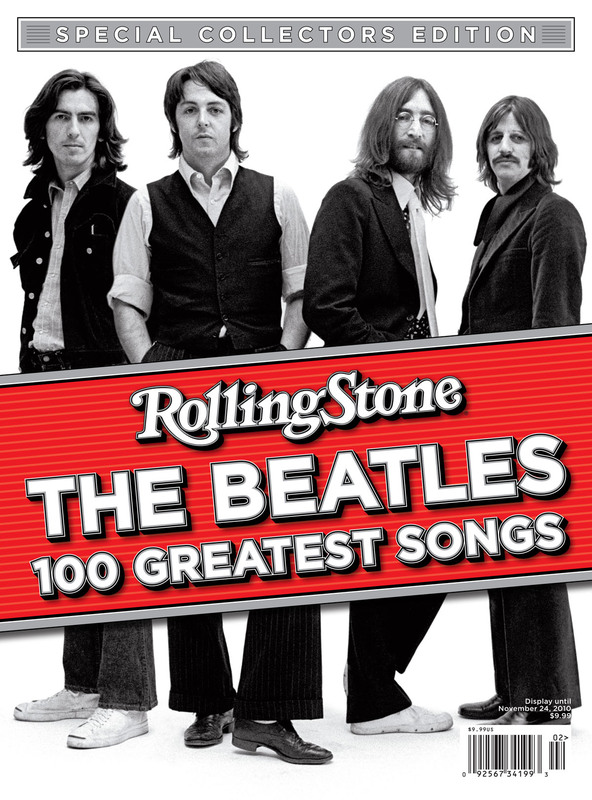 In a special Collectors Edition, Rolling Stone magazine has named its Top 100 Beatles songs of all time. (Apparently its the first time they’ve done this). News of the the special edition came out in the US on August 26. Following an introduction by Elvis Costello, the book features the stories behind each song, dozens of photos, an index of the complete list, and a breakdown of the numbers, including the years with the most songs (1965 and 1966 each had 17), the shortest song (“Her Majesty,” 23 seconds) and the song that spent the longest time at number one on the charts (“Hey Jude,” 9 weeks). The magazine has created a really nice page detailing their Top Ten songs – including some great photographs too. See also the different Australian cover. This entry was posted in Beatles, Beatles Books, Beatles Collecting, Beatles Music, George Harrison, George Martin, John Lennon, Paul McCartney, Ringo Starr and tagged 100 Best Beatles Songs, Apple Records, Beatles, Beatles Books, Beatles Collecting, Beatles Lists, Beatles Related, Beatles Rollings Stone Magazine, George Harrison, George Martin, John Lennon, Paul McCartney, Ringo Starr by beatlesblogger. Bookmark the permalink. I thought the special issue was a bit of a waste. It was pretty to look at, but overall it was fluff. I compared it to Stephen J. Spignesi and Michael Lewis’ book 100 Best Beatles Songs and found the Rolling Stone issue wanting. Thank you for your considered comment. I’m based in Australia and so have yet to actually clap eyes on this “Special Edition”. I was just reporting that it was available. But it sounds like it may be lacking in its critical reasoning for the status of individual songs, and why some have have made the list and others haven’t. I would point readers to your blog at http://www.allyngibson.net/?p=5350 which has a very considered review of the Rolling Stone book.